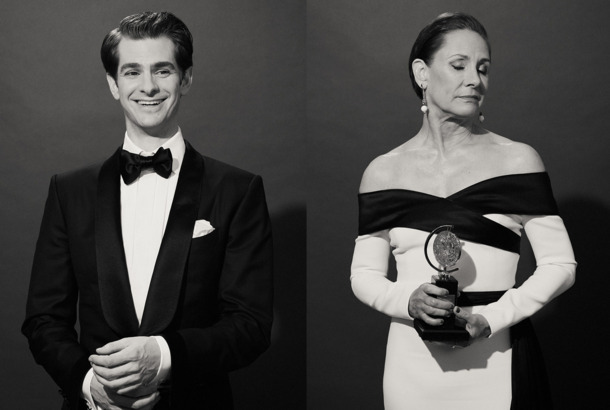 Andrew Garfield, Laurie Metcalf, and More Photos of the 2018 Tony Award WinnersServing drama. 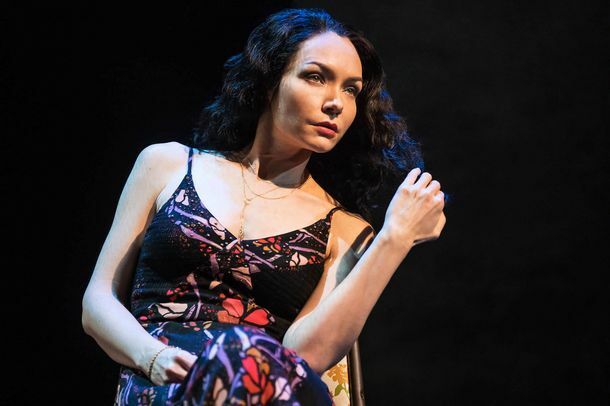 5 Long-Shot Votes I’m Casting for the Tony AwardsThey’re not likely to win, but I loved these performances and productions. Why Isn’t The Boys in the Band Up for Tonys This Year?It’s hard to get all of those stars in one place at one time. Mean Girls and SpongeBob Lead the 2018 Tony NominationsAngels in America, The Band’s Visit, and Harry Potter also made strong showings. Here’s What’s Eligible for Tony Awards This YearYour guide to the Tony committee’s most important decisions. 1984 Ineligible for Tonys After Refusing to Let Nominator See PlayThe New York Times reports Tony nominating committee member Jose Antonio Vargas was not permitted to see the show. Rachel Bloom’s Best Zingers From the Tony AwardsSo many tiny hats. Kevin Spacey Painfully Parodies This Season’s Musicals in Tony Awards OpenerKevin Spacey as Evan Hansen. Kevin Spacey as a drunken Russian. You get the idea. Here Are the 2017 Tony Award NominationsThe ceremony will air on June 11. Thespian Kevin Spacey Shows Off His Vocabulary in Tonight Show’s Mad Lib TheaterThe Tony host tries his hand at a new kind of theater. Tony Winning–Actor George S. Irving Dead at 94The character actor played the Heat Miser in the Rankin/Bass Christmas movies. The World Turned Upside Down: Highs and Lows From the Tonys of DiversityAbout time. Here Are the 2016 Tony Award WinnersLet’s keep track of the Hamiltonys. Vulture’s Tony Awards Predictions for Every CategoryIf you’re a betting sort, read this now. Tonys Deep Dive No. 5: Tech, Music, and DirectionPart five of five. Tony Awards Deep Dive No. 4: Performances in PlaysPart four of five. Tony Awards Deep Dive No. 3: Performances in MusicalsPart three of five. Tony Awards Deep Dive No. 2: The PlaysPart two of five. Tony Awards Deep Dive No. 1: The MusicalsPart one of five. Hamilton Leads 2016 Tony Nominees With a Record 16 NominationsPlus: Lupita Nyong’o, Michelle Williams, and Jonathan Groff. Congratulations, James Corden, You’re Hosting the Tony Awards This YearCorden won a Tony in 2012. Watch Neil Patrick Harris’s Tony PromosShow us the way to Broadway! Scott Brown: Who Got Snubbed at the Tony Nominations?Unfairly passed over, according to our theater critic: Nicky Silver, Finn Wittrock. Neil Patrick Harris Will Host This Year’s TonysPhew. Vulture’s Behind-the-Scenes Timeline of the Tonys (and the After-Parties)Who had potty mouths, and who was making out? Neil Patrick Harris Will Resume Tony-Hosting Duties This YearWhen does he get to host the Oscars? NPH Gets an Extra Emmy NodNeil Patrick Harris will have a third chance at an Emmy this year, thanks to a dude on some message board. Ratings Good for Bad, Bad for TonysThis is a clear mandate to give next year’s Tony for Best Featured Actress in a Play to a meth-head instead of a movie star. How Long Until Scarlett Johansson Has an EGOT?Five years? Sean Hayes Will Not Wear Gold Pants at Tonight’s Tony AwardsDarn. The Tonys Kill EnronThe show will close on Sunday. Jay-Z Will Totally Get a Tony If Fela! Wins Best MusicalCongrats, Jay! Is It the Tonys or the CAA Call Sheet? Our Critic’s Take on Today’s All-Star NominationsThe snubs, the surprises, the nominations people saw coming down Broadway three months ago. Fela!, La Cage aux Folles Lead Tony NominationsAlso: Congratulations, Scarlett Johansson! Conan Reportedly Blocked From Tony’s Hosting GigThe awards show could have actually been watchable. . . Barred From Voting for Tonys, Post Theater Columnist Unveils Plan to ‘Break Broadway’s Neck’The ‘Post’ theater columnist will have his revenge. Special Tony KilledThe Tonys’ administration has announced it will discontinue the award for Special Theatrical Event. Geoffrey Rush: Tonys After-Party KingHe won a Tony on Sunday, but as it turned to Monday, Rush proved himself worthy of another award: After-Party King. The Tony Awards: A Behind-the-Scenes TimelineWhat did the cameras miss at yesterday’s Tony awards? Vulture was there. Stephen Colbert Heads to the Middle East, Immediately Starts Making DecreesPlus: James Gandolfini clears up any ‘Shrek’-related rumors. Reasons to Be Pretty Killed by TonysThanks to a Tony shutout, Neil LaBute’s play will close this Sunday. A Tony Awards Love Story: Prince Falls for Karen OlivoAccording to our sources, Prince was watching the awards and had “fallen in love” with Olivo. And he decided he had to meet her that night.